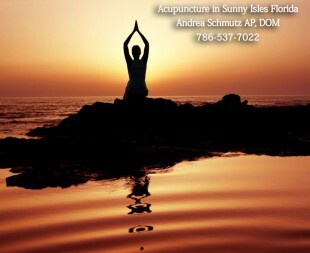 Acupuncture in Sunny Isles Florida – Looking for an acupuncturist in the Sunny Isles area? Are you tired and frustrated with traditional western medicine, pharmaceutical drugs and their side effects, and the high cost of health insurance that covers virtually nothing? Well than you’re in the right place. It is no coincidence that you have found us on the web today. Holistic medicine, and especially acupuncture and Chinese medicine, are powerful treatment modalities than can steer your body on the path to true and optimal wellness. Andrea Schmutz is a license acupuncturist, doctor of Oriental medicine that has a wealth of knowledge in both western and eastern medicine. Starting her career in healthcare as a registered nurse, she gained a myriad of experience that she now utilizes to treat many common ailments with an eastern approach. Her office is conveniently located within minutes of Sunny Isles, right on Biscayne Blvd. Take a look around this website and read how acupuncture works and how it can work for you. This ancient healing art can treat a wide array of conditions including chronic and acute pain, autoimmune diseases, infertility, digestive disturbances, allergy, pediatric concerns and much more. Andrea has the experience, knowledge and compassion to help you achieve your health goals. Read more about her and her approach by clicking here or call 786-537-7022 to get started today!